Kobe Airport was completed February 2006. With an estimated cost of over 1 trillion yen ($8.7 billion US), this project has been extremely controversial, considering that Kobe is already one of the most indebted regions of the country due to the Great Hanshin-Awaji Earthquake. The airport was built as an extension off of Port Island, and is accessible via the Port Liner. It is small, speedy, and convenient! If you are flying domestically and live in the western part of Hyogo-ken, then drive to Okayama airport, which is relatively close via the Sanyo expressway and has FREE parking. You can also take transfer flights from here to Tokyo. Okayama also has some international flights, and flying out of this airport allows you to avoid KIX’s \2,650 international departure tax when you’re flying to Korea. Korean Airlines flies to Seoul five times a week. 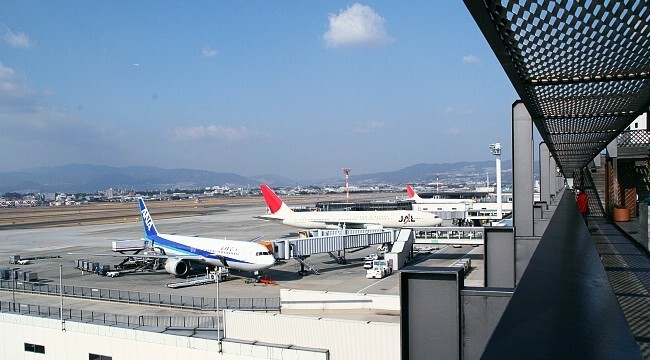 Osaka Airport, also called Itami Airport, is located in the southeast corner of Hyogo Prefecture, just northwest of Osaka. It is much easier to reach than Kansai Airport, and so is recommended for domestic flights or transfers to Tokyo. It is technically an international airport, but the vast majority of affordable international flights leave from Kansai International. If you’re going to Okinawa, going via Itami will save you a few hours. There is also a limousine bus service to KIX, so if you can get a friend to drop you off here, it’s a simple way to reach Kansai Airport. Also, there is some reasonably priced parking. Based in Toyooka, this is the domestic airport for northern Hyogo. It is 20 minutes from JR Toyooka by bus. There is onsite parking or you can park at Kogyo Danchi and take the free shuttle bus to the airport.